If you’re over age 40, chances are you’re starting to have some difficulty reading the fine print, particularly in dim light. Maybe you’ve been experiencing eyestrain, headaches or fatigue after reading or staring at the computer for extended periods of time. Or, perhaps you’ve gotten into the habit of squinting or holding out books, menus, magazines and other reading materials at arm’s length in order to focus properly. If so, welcome to the world of presbyopia. But what exactly is presbyopia? Simply put, presbyopia is a normal, age-related eye condition that causes blurred close-up vision. As people get older, the lenses within their eyes begin to thicken and become more rigid. The lens of the eye is the transparent structure behind the pupil and iris that focuses the light rays entering the eye to create images on the retina (the thin layers of nerve tissue at the back of the eye). The ability of the lens to bend is what allows the eyes to focus on objects at varying distances. When the lens loses its flexibility, near objects and fine details can no longer be brought into focus. Presbyopia affects nearly everyone by the time they reach their mid- to late-40s, and continues to progress and worsen with age. 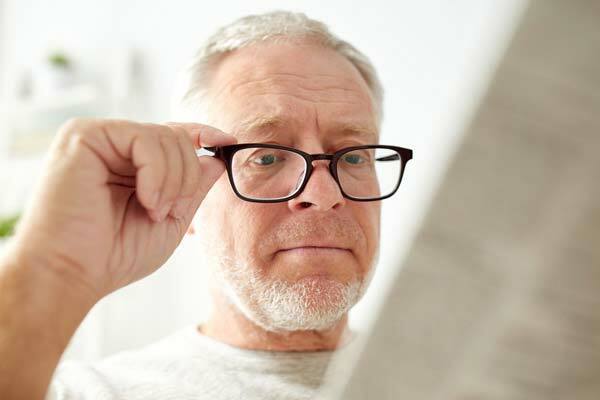 Symptoms of presbyopia include difficulty reading the fine print, needing brighter light to be able to read, eyestrain when reading or doing close-up work, frequent headaches, and momentarily blurred vision during the transition between viewing something up-close and then focusing at a distance. Sometimes people confuse presbyopia with hyperopia (farsightedness), when in fact these are two separate conditions with totally different causes. The reason for the confusion is that patients with hyperopia also have difficulty with close-up vision. However, hyperopia is due to an irregularly-shaped eye (either the eye is shorter than normal or the cornea—the clear covering on the front of the eye—is too flat), whereas presbyopia is caused by an inflexible lens. Moreover, the two conditions affect different age groups. People of any age, including babies, can be farsighted, but presbyopia is primarily seen in adults who are middle-aged and older. Unfortunately, presbyopia cannot be prevented by diet, lifestyle or visual habits, and there is no “cure” for it. However, many options are available to help compensate for the loss of close-up focusing ability. * Bifocal, trifocal or progressive lens glasses. * Bifocal, trifocal or multifocal contact lenses. * Contact lenses combined with reading glasses. * Monovision with contact lenses or LASIK surgery. Exactly what type of correction is right for you depends on your own unique vision challenges, needs, and lifestyle. Some patients rule out contacts altogether because they do not like the feeling of wearing them or the idea of having pieces of plastic in their eyes all day long, and for them, prescription eyeglasses or reading glasses may be all they’ll consider. Others do not like the idea of having to repeatedly put on or remove their reading glasses throughout the day, or cannot get used to bifocals, trifocals or progressive lens glasses. Instead, many of these patients opt for monovision (or “blended vision”). This is a technique in which the lens for one eye is “designated” for distance focus, and the lens for the other eye is “set” for near focus. Monovision is successful in many patients because of the way the eyes work. Everyone has a dominant and non-dominant eye. When you look at distant objects, you are mostly using your dominant eye. Because you primarily use your dominant eye for distance vision, if your non-dominant eye is corrected for near vision, there is only a negligible effect on your distance vision. With monovision, both eyes are still working all the time, but the eye that sees distant objects clearly will see close objects slightly blurred, and distant objects will appear blurry to the near vision eye. After an initial adjustment period (which may up to 2 to 3 several weeks), the brain learns which image to select, and the result is a clear vision at all distances. The advantage of monovision over the other types of vision correction listed above is the freedom it provides from reading glasses. Just one set of prescription contact lenses is needed—whether you are focusing close-up or looking at distant objects. You won’t have to have contacts or lenses to correct myopia or astigmatism, and then have to switch to your reading glasses to correct presbyopia when focusing on close-up details. Monovision using contact lenses can certainly be the ideal solution for many people. But it’s not right for everyone. This practice has varying success rates due to contact-lens intolerance among some patients or poor adaptation to monovision. In recent years, refractive surgeons have begun to use monovision LASIK to artificially correct one eye for distance vision and the other for near vision—instead of prescribing contact lenses for monovision. LASIK is a type of refractive surgery which surgically changes and improves the way light eyes enter the eye and focus on the retina. The advantage of monovision LASIK to patients is it allows patients to reduce or completely eliminate their dependence on glasses or contacts. For people with presbyopia, who can see far with both eyes, LASIK surgery would just be needed in one eye (generally their less dominant eye) and that would be adjusted for near vision. The other eye (normally the dominant eye) would be left “as is,” to focus on distance vision. If you already wear monovision contact lenses, you are a perfect candidate for monovision laser eye surgery. On the other hand, if you’re in your early 40s and you’ve always had 20/20 vision and are just now starting to have problems with close-up vision, you may also be a good candidate for monovision LASIK. The only way to know for sure is to schedule a consultation with Dr. Farooq Ashraf so you can be assessed. To book your appointment, please call the Atlanta Vision Institute at (770) 622-2488, or fill out the online contact form on our website.